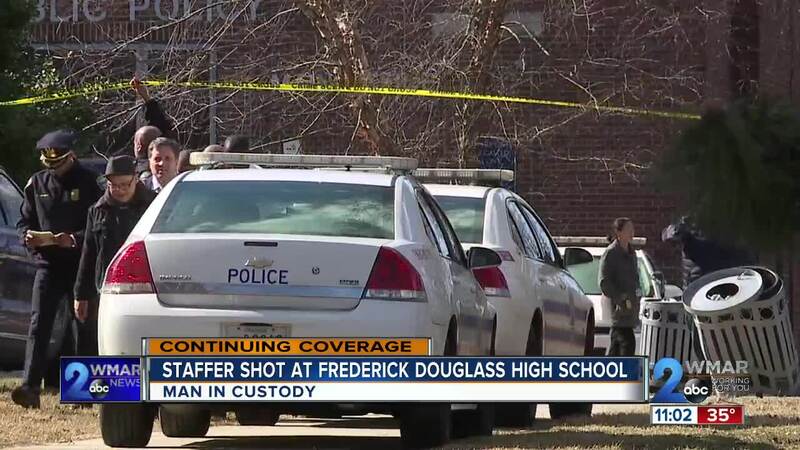 A Frederick Douglass High School staff member was shot in the school entrance. On Friday night, a Frederick Douglass High School staff member was in the hospital after being shot in the school entrance. BALTIMORE, Md. — On Friday night, a Frederick Douglass High School staff member was in the hospital after being shot in the school entrance. Police said the suspect went to the school with a plan to shoot and kill the victim. The 56-year-old victim was able to keep the suspect from getting into the school until two-armed Baltimore City School Police Officers stopped him. Just three weeks ago, the Baltimore City School Board voted unanimously to maintain that school police officers keep their guns in a lock box during school hours. The two supervisors were allowed to have their guns because they were on campus for a meeting and aren’t assigned to specific schools. Sgt. Clyde Boatwright, the President of the Baltimore City School Police Union, is again calling on the school board to reconsider that vote. The two supervisors were in the main office when the shooting started. Marietta English, the President of the Baltimore Teachers Union, had just finished a safety task force meeting and was heading out the door when she heard the news. The shooter never made it into the school, for more information on the shooting and reaction click here.